Donald Trump’s victory in the U.S. presidential election this month – in particular, his winning a clear majority of the Electoral College vote despite receiving nearly 1.3 million fewer popular votes than Hillary Clinton – prompted readers of another Pew Research Center Fact Tank post to wonder how the U.S. system compares with the way other countries elect their leaders. The short answer: No other democratic nation fills its top job quite the way the U.S. does, and only a handful are even similar. However, only the U.S. has a system in which voters elect a body of “electors” whose sole function is to actually choose the president. 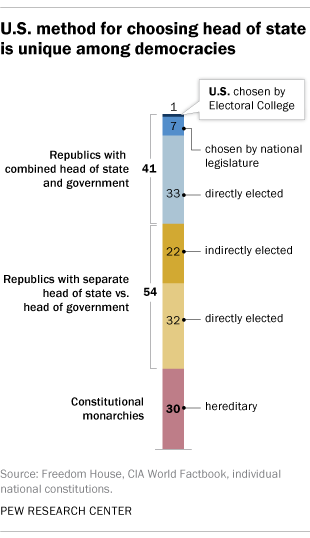 The other 29 countries that indirectly elect their head of state give that task to their national legislatures, supplemented in five cases by representatives of states or regions. The German president, for example, is elected by the 630 members of the Bundestag together with 630 delegates chosen by the state parliaments. The president of India is chosen by an assemblage consisting of all elected members of both houses of Parliament and of state legislative assemblies – nearly 5,000 “electors” in total, casting more than a million population-weighted votes. In making these sorts of comparisons, it’s important to bear in mind that not all “heads of state” wield real political power. In 69 democracies, the head of state (whether a president or a constitutional monarch) functions mainly as the personification of the nation and performs primarily ceremonial duties, while most executive power resides with the “head of government,” typically a prime minister. Most of the indirectly elected heads of state (22 out of 30) fall into this category. 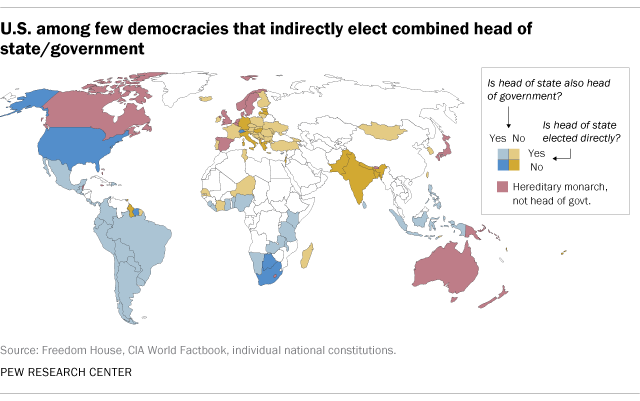 In 15 other democracies, the president and the prime minister share executive power. But in the U.S. and 40 other democracies, there is no separate head of government – the president fulfills both symbolic and substantive roles. In 33 of those 41 countries, the president is directly elected; 22, in fact, require an absolute majority of the popular vote for election.